Exploding fireworks Rhine River Lights draw spectacular pictures against the night sky and from the steep mountain sides, the repeating bang of the saluting guns and of the firecrackers resound to both sides of the Rhine river. 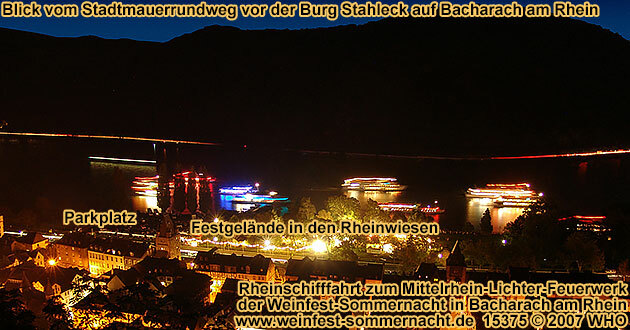 During this new wine event, famous vine dresser businesses and gastronomy businesses of the Rhine river valley will come together on the August weekends in an attractive event on the Bacharach Rhine river banks. The offer will be completed with a modern program with music and artistic presentations. 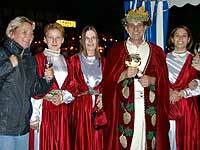 The "Wine Festival Summer Night" (Weinfest-Sommernacht) will be opened on Saturday, with gun saluting. Afterwards the water ski club Koblenz / Coblence (acting world champion and European champion) will perform a water ski show on the Rhine river. Beyond this, a freestyle chainsaw artist will show the audience his know-how. Starting at 8:00 p.m. the group "Rest of Best" will play entertainment music and dance music of the extra class. The music band last played in the German olympia pavilion in Salt Lake City and now guarantees a one-of-a-kind experience in Bacharach. 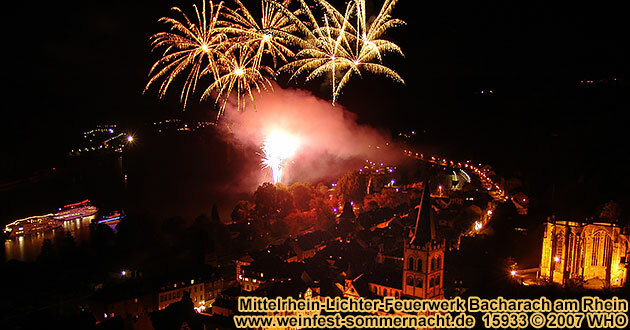 Highlight on Saturday evening is the romantic firework from the Rhine river banks. Although the firework doesn't necessarily count to the events of the fireworks of "Rhine river in flames / Rhine river aflame", it ranks in the rows of the magic beautiful bengal night fires between Koblenz / Coblence, Mainz and Wiesbaden. Punctual to the starting of the fireworks the boats meet at about 10:00 p.m. in Bacharach. The round boat trip on Saturday also represents itself as delighful offer, for a company festival or a department festival. If you would like to charter an extra boat for your company festival or request group prices for groups starting at 30 people, please use this group travel online form. Some of the boats will dock at about 10:15 p.m. in Bacharach. From the boat landing stage to the festival place it's only about 30 meters. The entrance is free. 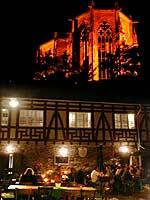 There's the possibility to drive back to Oberwesel and St. Goar with the bus for the disembarkating guest. 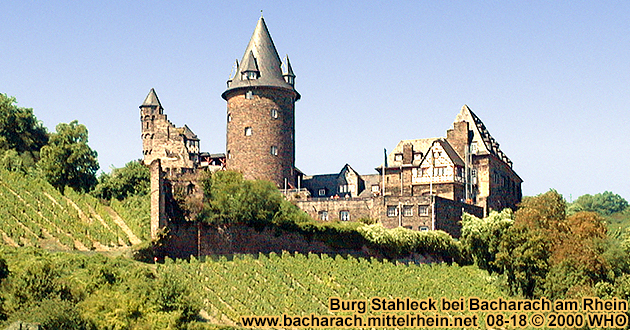 Above the wine town on the Rhine river, which is mystified from legends, castle Stahleck from the 12th century crowns on the heights as the emblem of Bacharach. It counts to the most beautiful castles on the middle Rhine river. 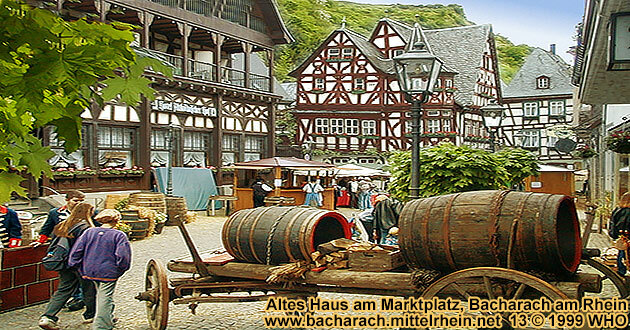 The historical old town core of Bacharach is stamped from pretty half-timbered houses. 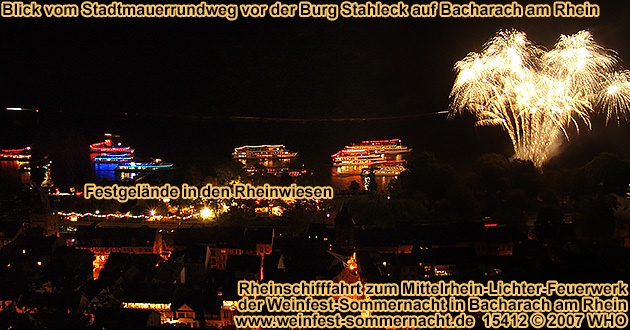 The historical town picture of Bacharach builds the scenery for the big firework. 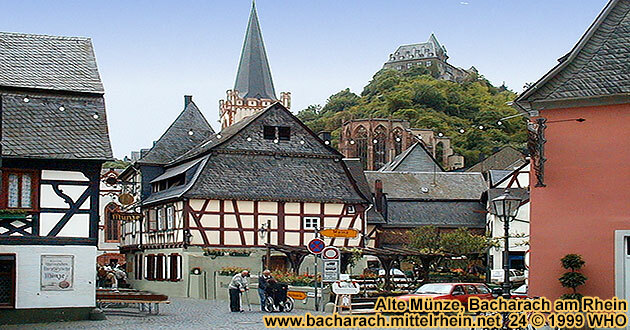 The beginnings of Bacharach lead back to the celtic latin settlement called "Baccaracum". 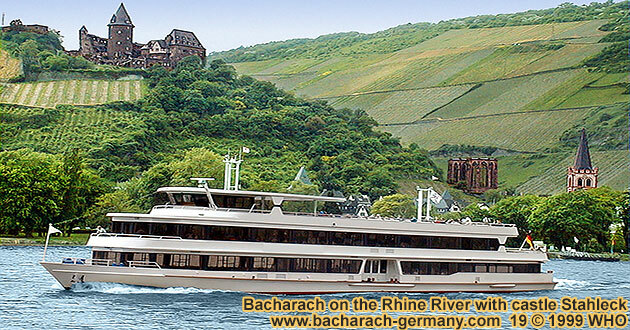 The legend says that in good wine years, a sacrifice was to be brought to the Bacchus on the "Bacchi ara", an altar-shaped rock in the Rhine river. The rock doesn't exist anymore, but the town name still reminds of the latin wine god. 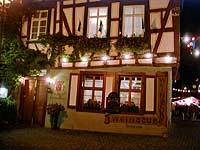 Starting at 11:00 a.m. on Sunday the "Wine Festival Summer Night" (Weinfest-Sommernacht) with its musical morning pint of the Jazz group "Full House" will continue. Starting at 2:00 p.m. a children's program will take care of entertainment for the small visitors. In the afternoon, the chainsaw artist will perform his acts again. 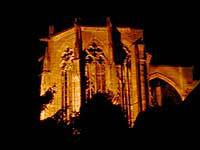 With the evening pint, the wine festival summer night will finally end. On both days, the guests will not be accompanied by a wine queen, but instead from the wine god Bacchus personally and his "Bacchantinnen". 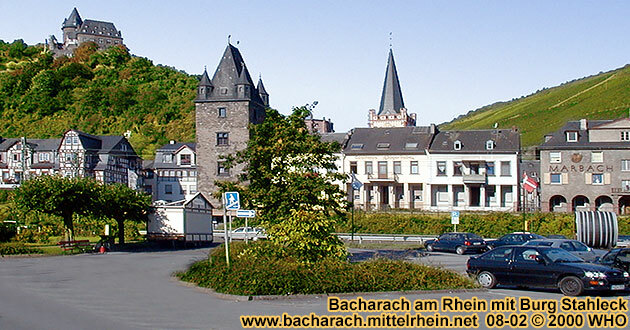 You'll reach Bacharach with the car, from Koblenz / Coblence or Bingen, by driving along the Rhine river on the highway B 9, alternatively over the freeway A 61 (Koln / Cologne - Ludwigshafen), freeway exit Rheinbollen / Bacharach. Bacharach also has good train connections. During the day, a train drives from Bacharach in direction Koblenz / Coblence alternatively Mainz every hour.